Named for the crisp sound fresh beans make when they are snapped in half, snap beans are also known as string beans or green beans. Available in supermarkets year-round, the versatile, nutrient-rich legumes are often boiled, steamed, sauteed, stir-fried or incorporated into casseroles, soups, stews and salads. Proper storage is critical, whether the beans are whole or snapped and fresh or cooked. Foodborne bacteria multiply rapidly if beans are left out too long. You can store fresh, unwashed, unsnapped green beans out of the refrigerator if the beans are in a clean, dark, well-ventilated room with a temperature between 45 and 50 degrees Fahrenheit. However, even unsnapped beans stay fresher if they are placed in the refrigerator as soon as possible. 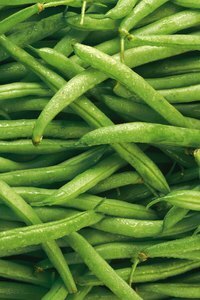 Once the green beans are snapped, they must be placed in the refrigerator, because bacteria and pathogens can enter through the broken ends. If you can't place them in the refrigerator immediately, put the beans on ice to keep them cool and then refrigerate them as soon as possible. Throw away uncooked snapped beans that remain at room temperature longer than two hours. Fresh, unsnapped green beans should be put loosely into mesh bags or bowls for unrefrigerated storage. For refrigerated storage, place unsnapped beans loosely in a plastic bag and then store the bag in crisper drawer. If the beans are unwashed, they will keep up to a week in the fridge, but the quality is better if you use them sooner. Washing green beans shortens the storage time, because it introduces moisture that can cause the vegetables to mold and rot. If the beans are soiled, remove surface dirt with a soft brush or paper towel before storage. To prevent growth of bacteria, throw out cooked snap beans that sit at room temperature longer than two hours, including the time the green beans were on the table. According to educators at the University of Nebraska Cooperative Extension, bacteria in food double every 20 minutes. Don't assume that boiling the beans removes the bacteria, because some toxins are heat resistant. Bacteria multiply even faster at high temperatures; put the beans in the refrigerator in an hour or less if the temperature is above 90 F.
Divide cooked snapped beans into airtight, leakproof containers. If the beans are hot, they cool faster in small, flat containers. Don't wait for green beans to cool before refrigerating them; modern refrigerators are able to safely cool hot foods. When you're ready to use the beans, heat them quickly in a pan on the stove top. Discard cooked beans after four days. University of Nebraska Cooperative Extension: Food Safety Q&A: Is This Food Still Safe to Eat?